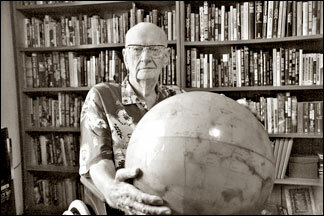 Sri Lanka’s best known resident guest Sir Arthur C Clarke celebrates his 90th birthday on December 16, 2007. The world’s best known writer of science fiction, Sir Arthur C Clarke was the first to propose satellite communications in 1945. One of his short stories inspired the World Wide Web, while another was later expanded to make the movie 2001: A Space Odyssey, which he co-wrote with director Stanley Kubrick. He has lived in Sri Lanka since 1956. Q: How does it feel to reach 90 ? A: Well, I don’t feel a day older than 85. And to quote Bob Hope, “You know you’re getting old when the candles cost more than the cake.” But the saddest part is that most of my friends and contemporaries are gone. During your life you’ve seen some of the most rapid and radical developments in technology that humanity has ever accomplished. Have things unfolded as you anticipated? Has anything surprised you? Growing up in the 1920s and 1930s, I never thought I’d live to see so much happen. It’s true that we ‘space cadets’ of the British Interplanetary Society spent all our spare time discussing space travel, but we never imagined that our dreams would become reality in our lifetime. I still can’t believe that we’ve just marked the 50th anniversary of the Space Age! Q: Of everything you’ve done and written, what’s the one thing you’re most proud of ? A: I have over 100 books and more than 1,000 short pieces to choose from. In terms of impact, I’d say it was ‘Extra-terrestrial Relays’ (Wireless World, Oct 1945) where I invented the communications satellite, and for which I was paid the princely sum of œ15. Q:What are you working on at the moment ? Will there be any more novels? Do you ever plan to retire? A: My plans for retirement always flop so spectacularly that I don’t even try now. Frederik Pohl is currently completing my latest novel, The Last Theorem, which has taken a lot longer than I expected. That could well be my last novel...but then, I’ve said that before! Q: What’s your favourite book of all time? Q: Does the state of the world today climate change, wars worry you? Do you think humans will prevail? Did you foresee such a gloomy future for us? A: I have great faith in optimism as a philosophy, if only because it offers us the opportunity of self-fulfilling prophecy. I’d like to think that we’ve learnt something from the most barbaric century in history that we’ve just lived through - the 20th. And climate change has resulted from our addiction to oil and coal. Developing clean energy sources in the coming years can prevent us making the situation worse, but we’ll have to live with many adverse consequences of our planetary meddling. But humanity will prevail. Q: What is the greatest threat that we, as a race, are facing? A: Organised religion polluting our minds as it pretends to delivery morality and spiritual salvation. It’s spreading the most malevolent mind virus of all. I hope our race can one day outgrow this primitive notion, as I envisaged in 3001: The Final Odyssey. Q: If you were world leader, what would you change? A: States and governments mixing governance with religion. This is a lethal cocktail that keeps billions in misery. Religion must be a very private affair that should never be a spectator sport. Q: Who would you banish to a parallel universe? Q: Who would you clone ? Q: If you weren’t giving this interview, what would you be doing? Q: What gadget would you most like to see invented ? A: A time-viewer with which we can see what happened in the past and might happen in the future, but without us risking the journey ourselves. The Light of Other Days (2001) is based on this idea. Q: If you could travel anywhere in the universe, at any time period, when and where would it be and why? A: I would like to be present at the first contact with extra-terrestrials - assuming that they’re not as unpleasant as H sap. Q: In 2003 you claimed that there’s vegetation on the surface of Mars. Do you still think that’s the case? A: After studying dozens of images returned by recent Mars surveyor missions, I found some surface features that looked very like Banyan trees. Something is actually moving and changing with the seasons that suggests, at least, vegetation. Of course this needs verification, which I hope will happen soon. If true, this would help human settlements on the Red Planet one day. A: It isn’t quite cold and it’s probably not fusion, but something is going on. For a decade or more, I’ve kept an open mind about these new energy experiments, even though we have yet to see commercial scale results. I eagerly await the final verdict on this affair - the jury is still out. I would be disappointed if ‘cold fusion’ turns out to be a mere laboratory curiosity. But that seems unlikely: anything so novel would indicate a major breakthrough. Of course, if these anomalous excess energy results can be scaled up, that could terminate the era of fossil fuels, end worries about climate change, and alter the geopolitical structure of our planet out of recognition. Q: Are there any other ideas considered wayward of the mainstream that you support, and why? A: I’ve been promoting the Space Elevator for over 30 years, beginning at a time when people could not suppress their laughter. But nobody is laughing now, and it is almost ‘mainstream’. I would still keep an open mind on time travel and multiple probabilities universes - where everything that can happen does happen. Q: What do you think is the single most important advance that humans will make before the 21st century is out? Q: Would you ever consider having yourself cryogenically frozen? And if so, when would you ask to be revived? A: I have no wish to be frozen, or to have myself preserved in any other way. My garden in Colombo holds the graves of several beloved pets, and one day - though not I hope for a long time - my own ashes will be deposited alongside them. Who do you think are the rising star writers and scientists of the future? There are so many talented writers and a new breed of public scientists today that it would be unfair to single out any. They have many more ways of reaching out and engaging their audiences today than we did back in the first half of the 20th century. Q: What is your message to the young thinkers, scientists and writers of the world today? The original interview appears in the December 2007 issue of the UK’s Focus magazine, on sale now. For further information, visit www.bbcfocusmagazine.com. Focus is the BBC’s multi award-winning popular science and technology monthly, published by BBC Magazines Bristol, UK. “I would like to close by mentioning a possibility of the more remote future—perhaps half a century ahead. Today, the Clarke Orbit has over 330 satellites. Sir Arthur C. Clarke, a science-fiction author, inventor, and futurist, simply a great mind celebrates his 90th birth anniversary on 16th of December, 2007. In 1959, he founded the Ceylon Astronomical Association (now known as Sri Lanka Astronomical Association). As the current General Secretary of the Association, I’m honoured to run an association founded by him. And as a big fan of his writings and admirer of his work, I have put up a blog where every one could wish him for his 90th birth day. Let us wish together a healthy and a long life for Sir Arthur.